The family referred to above is mine, the gentleman my great grandfather. Easter week 1916 claimed his business and home. His once thriving tobacconists at 27 North Earl Street (close to the corner, across from the GPO) and his cigar stall in Westland Row station, were looted and wrecked. 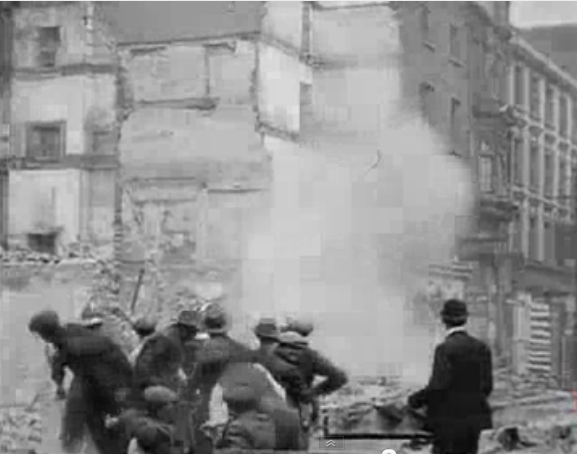 When the guns in the grounds of Trinity College were trained on Sackville Street, in an effort to oust the rebels from the GPO, the ensuing inferno destroyed blocks of businesses and homes in the surrounding area. Afterwards, he tried to salvage his business but his creditors refused to provide new stock, and his insurance did not cover the extent of the damage. His claim for compensation to the British government took months to be processed and when paid was a pittance. Sadly, the insurance claim lists all of their belongings, including most poignantly for me, the wedding trousseau of my great aunt. But they were the lucky ones – they were unharmed. The family left North Earl Street and never returned. My great grandfather died three years later, his wife in 1920. The centenary of 1916 will be celebrated in Dublin and everywhere around the world where the Irish are gathered this weekend. There is no question that this was a turning point for a nation. It is sad, however, that it was written in the blood and anguish of so many. Five hundred people lost their lives during the Rebellion, including innocent civilians, unarmed policemen and British soldiers. In the frenzy of nostalgic, and sometimes rose-tinted remembrance, it would be nice to spare a thought for those families who were thrown into the darkness of grief and despair, regardless of nationality or political belief. I will leave it to others to eulogise the men of 1916. I’d rather remember the forty families who lost their children during Easter week. I cannot begin to imagine what their pain must have been or that they found any consolation in the fact that their children died as innocent bystanders in the fight for Irish freedom. It is right to commemorate the birth of an independent nation; I just wish it had not cost the lives of so many. 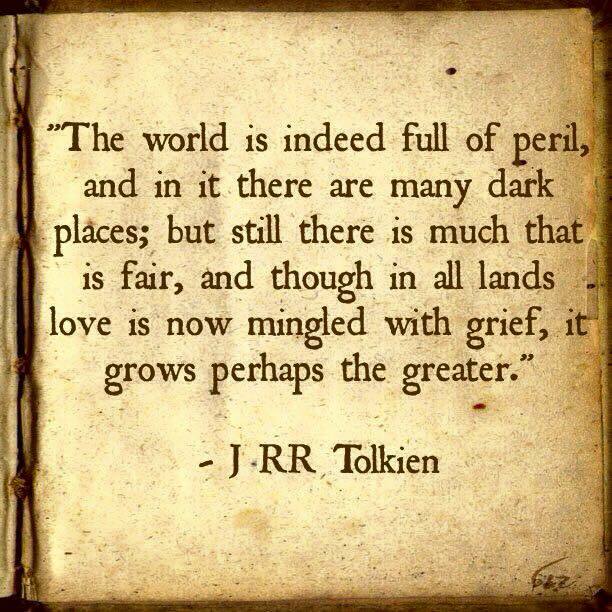 I’ll leave you with the words of Tolkien. Sadly I doubt there are many people in England who even know what the Easter Rising was. I was born only 40 years later and although I’d heard of it have just had to look it up on Wikipedia. As the saying goes, ‘History is written by the victors.’ Although we won that particular battle we ‘lost’ ultimately, I guess that’s why we as a nation have only a vague memory. Shaming really, isn’t it! Also when people live through those kind of events they probably try to forget about them. My grandmother never spoke about 1916 or the civil war and yet both impacted greatly on her life. The only people to blame for the atrocities of 1916 are the British, they refused decade after decade to give Ireland back to the Irish, it took a rebellion to eventually gain freedom just sad that so many had to lose lives and property in the process. I thought the recent TV programme on 1916 presented by Brendan O’Carroll, and including his own family’s part in the rising, was a very balanced view of events. It showed there were serious errors made by all sides in the rising. In a move that was prescient of the slaughter to come in the trenches, the British military sent several hundred raw recruits – who actually thought they were being sent to France – across open ground in the face of heavy gunfire, and two hundred of them met their deaths. The rebels misread the feelings of Dubliners, who mostly resisted them and threw stones at them, and the British Government, having suppressed the rebellion, took the foolish decision to execute and thereby make martyrs of the rebels, inspiring the subsequent war of independence. My Mayo grandparents were not intellectuals but farmers. They were opposed to Irish independence, however, as they feared that removal of the British ‘yoke of suppression’ would lead to the suppression of Ireland’s economic development for a long time to come. Thankfully there has been some balanced journalism on Easter Week but as a nation we tend to view it all through (as another commentator put it) green-tinted glasses. Thank you for sharing the experiences of your family. I’ve just come back from a press tour of 1916 Dublin (and written about it for the Irish Post). I think a real effort has been made to tell a balanced story and remember those who were caught up in the Rising and suffered because of it. Their stories should be told too…. Absolutely Bridget – perhaps even more so. I feel very uncomfortable about the way the rebels have been sanctified when the cost of what they did was so high for many people including the rebels’ families – some who were left destitute. Remembering the suffering of all is a must. We must also remember the suffering of the people under the dreadful times when the Black and Tans terrorised Ireland and it`s people. My Granny and her family lived through those times and it was horrendous, the Croke Park massacre nearly killed my Grandad and my Great Grandad, thankfully they managed to escape as they were near the fence. These stories and the one you tell are the suffering of the people behind the big events and should not be forgotten. I’m happy that Ireland became a Republic but it was at a very high price – too much for some. It’s good that all sides of the Rising are being highlighted and those who paid a price, for something they didn’t even ask for, should not be forgotten. If I had been alive and living in Dublin at that time I’m not sure where I would have stood, irrespective of whatever social class I belonged to – hindsight is a wonderful thing. I think it is always very difficult to judge historical events. History has her ways. Thinks happen for a reason, in a certain moment and a certain place. To try and understand these reasons may make us better persons, I believe. A balanced view is something invaluable.